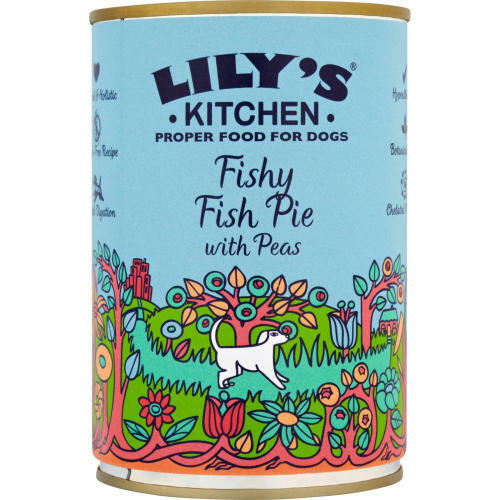 The Lily's Kitchen Fishy Fish Pie with Peas Dog Food is a very tasty new fishy recipe from Lilys Kitchen is a complete Holistic wet food for your dog, packed full of goodness – fresh salmon, fresh herring, fresh turkey together with market vegetables and botanical herbs. This recipe is grain free! The sustainable fresh fish used here are a wonderful source of essential fatty acids including Omega 3, which provide superb health benefits for skin and organs. This recipe is also great for sensitive dogs who need a gentle meal which is easily digested. Fresh turkey meat 30%, fresh herring 20%, fresh salmon 15%, organic potatoes, organic peas 3%, organic carrots, spinach, hemp oil. Botanical herbs: golden rod, alfalfa, rosehip, cleavers, marigold petals, milk thistle, dandelion root, burdock root, nettles, celery seeds, aniseed, and kelp. Vitamin A 3000iu/kg, Vitamin D3 200iu/kg, Vitamin E 30mg/kg, Biotin 300mcg/kg, Zinc sulphate monohydrate 15mg/kg, Manganese sulphate monohydrate 3mg/kg, Calcium iodate anhydrous 750mcg/kg, Sodium selenite 300mcg/kg. No rendered meats, carcass or derivatives, nothing Genetically Modified, no artificial preservatives, colours, taste enhancers or sweeteners. No wheat, corn or soya. We use only whole meats, grains, fruit and vegetables - to produce a delicious, nutritious, digestible food for your dog. Suitable for Puppies from 4 months and older.